When Theresa Osborne takes a much-needed summer holiday at Cape Cod, she finds a lot more than a break from the hustle and bustle. On an early-morning jog along Cape Cod Bay, she comes across a corked bottle with a scrolled-up message inside that reads, "My Dearest Catherine, I miss you, my darling, as I always do, but today is especially hard because the ocean has been singing to me, and the song is that of our life together..." It bobbles around in the same vein for several more paragraphs and ends with "...am alone on the pier and I do not care what others think as I bow my head and cry and cry and cry. Garret." Garret may eat quiche, but no bother--before you can say "Look! I found two more letters!" 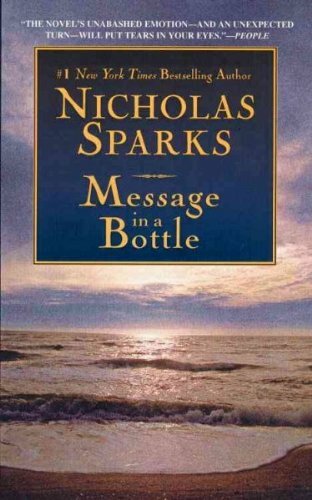 Theresa is hot on his trail and determined to find this mysterious yet sensitive message-in-a-bottle man. She finds him at a sleepy North Carolina port, working on his beloved sailboat, The Happenstance. From there, a romance buds and blossoms into a colorful bouquet of emotional baggage. Theresa has problems with her past--or, more accurately, her past is a problem. She is so scarred from her "I'm a super churchgoing guy now that I've run out on my wife" ex-husband that she hasn't tried to date since her divorce some three or four years before. And who is Catherine? And what's Garret's bag, anyway? When Theresa finds out, she plunges to the depths of her soul and uncorks a whopper of a secret about herself, bringing Garret to terms with who he really is.